The former Luxor cinema in Lancing, and inset, developer Josh Blakemore. Photo by Derek Martin Photography. The victim of the Luxor building theft yesterday has said the incident was ‘devastating’ but thanked the community for their support. 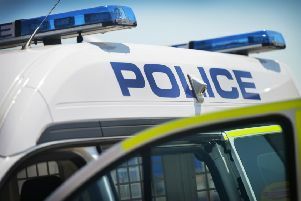 Sussex Police said at around 7am yesterday the building site in Station Parade, Lancing, was reported to have been broken into and a number of tools stolen. Josh Blakemore is company director of Machin Investments, which is turning the former Art Deco cinema into 12 apartments while keeping the iconic facade in what he described as a ‘labour of love’. At 8am yesterday, he was alerted by his site manager that there had been a break-in, and rushed there from his home in Shoreham to see what had happened. He said that two storage areas used to keep tools had been broken into by forcing the locks forced open with a spanner and pickaxe. More than £4,000 of tools were taken, including a large Makita road breaker, a Kango meduim breaker, a Stihl petrol cutter, a dewalt laser level, a Paslode nail gun, a makita nine-inch cutter and a 110V circular saw. He said: “It is devastating really. It holds the project up. It was the third time the site had been broken into in their first month of construction, the 28-year-old said, but the first time anything of serious value had been taken. He thought the intruders may have climbed up the scaffolding to get access to the site. Police are investigating the theft, and Mr Blakemore said they were waiting on CCTV footage from ASDA and other nearby shops to see if a getaway van to pick up the stolen goods was caught on camera. Sub-contractors working on the site have had to be sent home while police search the site, meaning they are losing their income, and Mr Blakemore and his business partner Will Machin will have to invest in more robust security. Since he posted about the incident yesterday on Facebook, hundreds of people have shared it and fellow builders have offered to lend him tools while they order new ones. Mr Blakemore said: “The help and feedback has been fantastic. A Sussex Police spokesman asked for witnesses to contact police online, quoting serial 279 of 24/8.